Francesca takes her place at the center of a small basketball court, where about twenty colleagues await her from the Ngokolo health center, where she has been working since the start of the year. She recognizes Director Katambi, with his impressive stature and good-natured eyes, the nurses who follow her on her rounds every day, the administrators, the pharmacy employees, and the Muslim workers who give patients support and comfort. But none are wearing their work uniforms. Instead they in dark pants or skirts and colorful t-shirts with the logo of “Test and Treat”, the Doctors with Africa CUAMM’s project against HIV in Tanzania. 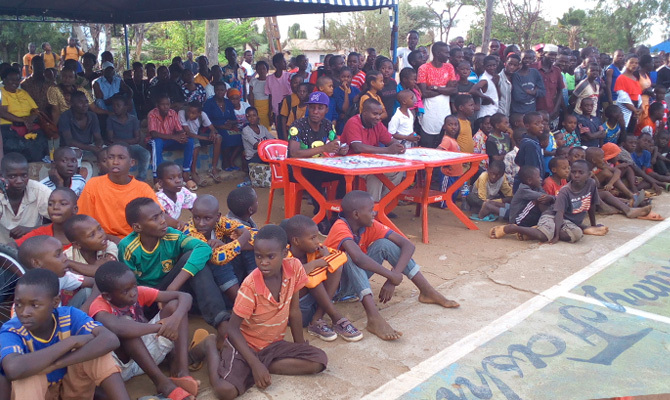 It’s a special occasion: the Shinyanga city government organized a musical event for the public, and as, fortunately, happens more and more, they chose to invite CUAMM workers so they can give HIV tests to the many young people in attendance. For the entire ten days of the event, a CUAMM gazebo is set up on the side of the basketball court, and trained CUAMM workers invite people to get tested and give them information about how to avoid contracting and spreading the virus. But Francesca and her colleagues are here today for another reason. They’ve decided to form a choir and take part in the event, leaving the health center for a few hours to get out among the people. Being in direct contact with people also helps counteract the distrust that often keeps people far from health facilities. Before them, a group put on a breakdance show; this is most popular kind of dance among young people and the many people lining the court are thrilled. Young people and adults are standing, sitting on the ground, and leaning against bikes. Having fun, they are watching curiously, chatting, and, most importantly, glad to get tested. Arianna Bortolani, in a double role today as the project manager for Test and Treat and as contralto in the chorus, says, “Raising awareness among young people is key”. By the end of the event, CUAMM tested 258 people, 20% of whom were adolescents. Only six people tested positive, three men and three women. And none were adolescents. There is still a long way to go. The project, which started in February 2017, aims to test 300,000 people in five years in this country where HIV is considered one of the leading causes of death. The tight-knit, dynamic staff includes local and international workers and is always ready to organize and take part in events like this one, committed to reaching a goal that, though still far, is possible.